The Heritage Golf Club will run a number of Open Competitions during PGA Championship Week, starting with their Seve Series Singles on Monday 10th August and culminating with their Bubba Blues Challenge on Saturday 15th & Sunday 16th August! The midweek entry fee is only €25 per person while you can add a Cowboy Steak from Judge Roy Beans for just another €10, the entry fee over the weekend is €40 per person. 1st Prize for each competition during “Major Open Week” will be 1 Night’s B&B for 4 people in The Heritage Luxury “Augusta” Apartment along with a Round of Golf for 4! 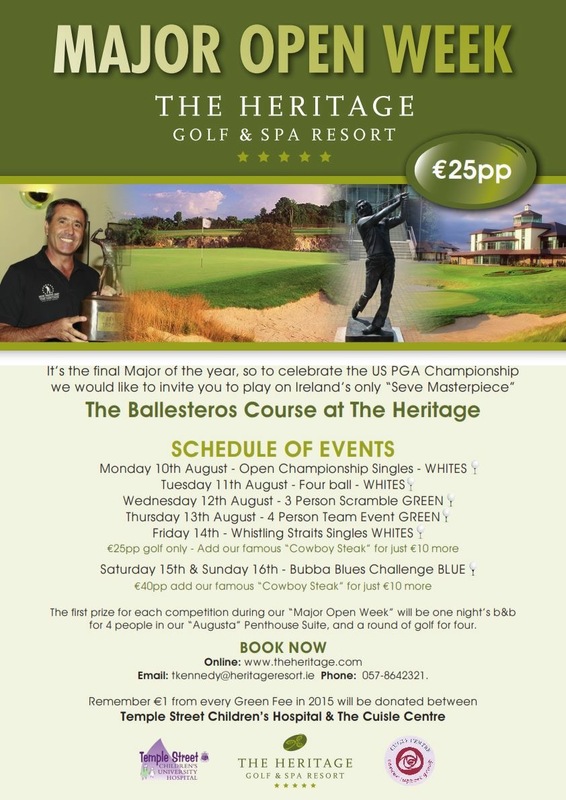 You can book online by clicking HERE, phone bookings are also available by calling the Golf Shop on 057-8642321 while you can also email info@heritageresort.ie with any queries. Remember €1 from every Green Fee in 2015 will be donated between Temple Street Children’s Hospital & The Cuisle Centre. Nearly 10,000 events have been posted by golf tournament providers all over the world and the list continues to grow rapidly.